DON’T WALK IN THE BIKE LANE. As a biker, it makes me so nervous when I’m dodging tourists in the bike lane. You all have a sidewalk and and you might get hit by a biker if you decide to walk in the red instead of the sidewalk. Be careful, please. Don’t take selfies in the bike lane, don’t jaywalk and realize that some bikers will not stop for you even if you’re in the crosswalk (they are supposed to stop). If you’re being dinged at, you’re doing something wrong . Click for tips about biking in Amsterdam. This is a walking tour because biking in Amsterdam is a terrible idea if you don’t bike at home as you’re likely to not really understand the signage and/or hit a tourist who is walking in the bike lane. I carefully laid out this tour to include my favorite places in Amsterdam and food that wasn’t too far from the route. If you struggle a bit with long distances, I include many stop off points and cafes. Similarly, you’ll find many benches along the main areas. Similarly, if you do this walking tour of Amsterdam with the help of public transit, it will cut the distance in half. Amsterdam is generally safe although pickpocketing is an issue in very touristy areas (especially the Red Light District), so avoid having your phone out if you don’t need it out. If you prefer a longer itinerary with a slower pace, click for my three day Amsterdam. You have lots of great options for breakfast in Amsterdam. Then have breakfast at Omelegg, one of my favorite breakfast places in Amsterdam for an American style breakfast. If you’re feeling like you want to indulge your sweet-tooth, lots of people are obsessed with De Bakkerswinkel for fresh made pastries at one of Amsterdam’s best bakeries. For a Kiwi-style vegan breakfast, I recommend Bakers and Roasters. Go on a canal boat cruise and if you’re craving a bit more adventure, rent your own boat (which is how the locals do it). There’s nothing like seeing Amsterdam from the canals. If you happen to have more than one day in Amsterdam, renting your own boat is so much fun although you’ll need a bit more time if you decide to do so, so you might need to adjust this schedule a bit. Renting your own boat is about 50 per hour, so it’s worth it for a larger group of 4+. You’ll have many canal tour options from Centraal Station, but most canal cruises in Amsterdam are pre-recorded. It’s much more fun to do a canal cruise where you have a live tour guide showing you the sites and history, so check before you book your canal book cruise. Head to my favorite museum in Amsterdam, Ons’ Lieve Heer op Solder(Our Lady in the Attic). If you’re a history or architecture buff, this is where to come (except on Sundays when they open at 1pm). The idea of going to a converted church does not sound cool, but you’ll walk past one of the house that holds this museum…and you’ll realize that the creator of this hidden church (a fascinating part of Dutch history) sewed together three of these houses and hid a decently sized church in the attic of all three. All canal houses have been kept in as close to original condition as possible, so you’ll learn not only about the history of the Netherlands, but also about Dutch architecture, and what life was like in the Golden Age of the Netherlands. You’re probably already starting to see the the red light windows as you walk towards the heart of the Red Light District in Amsterdam, which is all around the Old Church (Oude Kerk). For the record, you cannot take any photos in the Red Light District of Amsterdam. Stay walking along Nes or Oudezijds Voorburgwal and find the door to the Begijnhof (next to the American Book Centre). Here, you’ll find the most famous and touristic hofje in Amsterdam. Hofjes were closed communities from the middle ages where seniors and/or widows would live together as a community. However, the Begijnhof functioned almost like a nunnery, only for devout women, although women could leave the order to marry. Click to read about more secret spots in Amsterdam! That said, you should be waiting until it’s getting cold to plant your tulips, so if you’re visiting in the peak of summer, it’s less likely that your tulips will pop up every year. IF YOU DREAM OF SEEING THE TULIPS IN THE FIELD, YOU CAN SEE THEM IN THE TULIP FIELDS IN THE NETHERLANDS FOR FREE ON ANOTHER DAY. CLICK FOR INFORMATION ON HOW TO SEE THE TULIPS! Take the 24 tram towards the Heineken Experience (Marie Heinekenplein stop). If you’re keen on doing your own self-guided walking tour instead, walk towards the 7 Bridges look out spot for that iconic Amsterdam photo. You’ll be close to the Heineken Experience. I generally don’t recommend visiting the Heineken Experience as there’s so much good beer in Amsterdam and paying 20+ euros is crazy to me when you can pay 5 euros for a tour and a beer at my favorite Amsterdam brewery. Now you’re in De Pijp, one of the best neighborhoods in Amsterdam. If it’s any day besides Sunday, I recommend getting cash out and eating the fresh made food along the Albert Cuypmarkt, one of Amsterdam’s largest neighborhood markets. Definitely browse the market for delicious food (this is why I made you wait to eat! ), souvenirs, and spices. Keep an eye out for Surinamese Roti, Indonesian food, haring stands, and freshly made Stroopwafel. You’ll want cash for this market! Be sure to get a FRESH stroopwafel for dessert, which is made in front of you by the vendors here are famous for stroopwafel. If you’re looking to sit down or it’s a Sunday, head to Bazar, The Butcher, or my favorite Indonesian restaurant in De Pijp, Sari Citra for a reasonable relaxed meal. Ferdinand Bolstraat is the heart of De Pijp, however you’ll find lots of cute streets off of it, including the Wake me up when I’m famous Bench. Museumplein is a 7 minute walk from Marie Heinekenplein or only 500m from the Wake me up when I’m famous bench. Walk over to Museumplein to see theiAmsterdam sign as well as the Van Gogh museum, the Stedelijk museum for modern art, and the RIjksmuseum. The Rijksmuseum requires at least three hours if you want to visit although the Stedelijk museum/Van Gogh museum can be done in two hours if you’re fast. Book your tickets in advance for the Rijksmuseum and Van Gogh museum to avoid lines. I’ll assume you’re going to one of these. 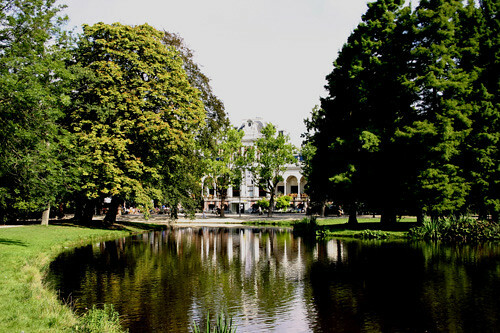 Before it gets dark, walk 1km to Vondelpark to enjoy Amsterdam’s most beautiful park! If you want more time, you’ll need a bit less time at the art museum. If you want to stop for a drink, I recommend the Blauwe Theehuis, which also happens to be one of the best spots for PokemonGo in Amsterdam. It’s 1.5km to the Foodhallen, so you can take the tram/bus from Vondelpark to the Foodhallen. Alternatively, you can walk. Head to the Foodhallen for an dinner (or early dinner) in one of many booths. I personally love Mazza although I’m also a huge fan of the Bitterballen bar (very Dutch). The booths change often although make sure that someone saves your table while you get food, otherwise your table will be gone when you get back. You can sample good Amsterdam local brews, including Two Chefs and Bird, at the bar here. If you only have 24 hours in Amsterdam, you need to try some of the fantastic craft beer in Amsterdam, not just Heineken. From here, take the tram towards the stop Westermarkt. The Jordaan is one of my favorite areas of Amsterdam. Before you explore the Jordaan, you’ll want to visit the Anne Frank House. It’s a little known fact that the Anne Frank House is open late on Saturdays. Take advantage of the lull in the crowds if you don’t have tickets and get in line at the Anne Frank House. People usually start leaving around 7-8pm, especially on Saturdays. Alternatively if you reserve your Anne Frank tickets online (which is best), you’ll be going to the Anne Frank House in the morning and early afternoon. (The Anne Frank museum has changed their policy and it is ticket-only in the morning, so no point in lining up early). You may want to reverse this Amsterdam itinerary depending on your Anne Frank ticket time. That said, if you’re not a museum person, I’d choose between the Anne Frank Museum and the Rijksmuseum. If you only have one day in Amsterdam, use the time to use the Jordaan instead. If you want to stop off at a great cafe after, I recommend Struik for hipster vibes, Cafe Chris if you’re into dive bars, and Mazzo if you’re into nice wine bars. Walking along the canals in Amsterdam is still one of my favorite things, so after you leave the Anne Frank house, walk along Prinsengracht. Stop off at Winkel43 for the best apple pie in Amsterdam or Monte Pelmo IJS for the best ice cream in Amsterdam for dessert. There’s tons of cosy brown bars in this area as well as hidden hofjes, but all are closed to the public at night. I recommend getting a craft beer or a traditional drink (perhaps some jenever) at the beautiful Papeneiland Cafe. If you want to wander, head towards the tip of the Jordaan towards Palmgracht and Brouwersgracht for the architecture. ​ If you’re tired after this one day in Amsterdam, I hope that you enjoyed this walking tour of Amsterdam! LOVE TRYING NEW DRINKS? WE TRIED OUT ALL THE DUTCH LIQUORS THAT WE COULD FIND. READ ABOUT 13 INTERESTING DUTCH LIQUORS AND SPIRITS TO TRY IN THE NETHERLANDS. Well, you have one day in Amsterdam and possibly one night in Amsterdam, you might as well party it up. If you’re still in the mood for an artisanal cocktail after the Anne Frank House, head to Vesper if they’re open. Otherwise, head back along Haarlemmerdijk to find the buzzing coffeeshops (not coffee) and late night snacks. It’s about 1km from Papeneiland back to Centraal Station. If you’re looking for a more relaxing evening with more walking, I always love walking down Herengracht and Keizersgracht late at night. It’s so quiet and relaxing. Good things to know about going out in Amsterdam: Most things in the outer neighborhoods will be closed besides bars and maybe a late night food place. Centre will be going ALL night. This is when the Red Light District is the most crowded, but it’s really best to go in the daytime if you’re set on visiting the Red Light District in Amsterdam. Public transit mostly shuts down after midnight, however there are night buses that run late although they cost considerably more than the normal bus. Plan ahead before you go out and avoid taxis if possible as they’re known to scam tourists. Depending on when your trip is, be aware that Airbnb is getting much more regulated in Amsterdam and during high season, finding an affordable hotel close to your dates is more difficult. I recommend booking your hotel/hostel ahead. If you’re looking for something cheap and central, consider staying at Stayokay Hostel. For a mid-range hotel, I recommend the Student Hotel, which has a great design and comfy beds. Those looking for a boutique hotel will love Pulitzer Hotel with a central location composed of 20 typical Amsterdam canal houses. For a more luxurious experience, consider staying at the Conservatorium Hotel. CHECK HOTEL PRICES IN AMSTERDAM! Walking only self-guided itinerary: 11.5km or 7 miles. One day in Amsterdam with taking public transit: 6.6km or 4 miles. Click for your free map of this walking tour! I really hope you come back for longer. I think that three days in Amsterdam is perfect and you can read my itinerary for it. Similarly, consider taking a day trip to another city in the Netherlands. HAVE YOU BEEN TO AMSTERDAM? LET ME KNOW WHAT YOU THOUGHT OF THIS ONE DAY IN AMSTERDAM ITINERARY! Please share if you found this self guided walking tour of Amsterdam helpful! Thank you for this! Amsterdam has been on my list for awhile and my favorite way to explore the city is on foot and I love that this helps me see as much as possible in the most efficient way! Definitely saving this post for when I go! Love this! Amsterdam is one of my must see places and this walking tour and map is perfect! Thanks for all the excellent tips. Wonderful timing, I am off to Amsterdam in a few weeks and this is an absolutely perfect itinerary. I also really appreciate the wheelchair information which is so often left out of these itinerary type of posts. I’d use this guide even for more than a day! Amsterdam is one of my favorite cities in Europe. I love its brick buildings, open skyline, rich history, and relaxed, easy going attitude towards life. The canals of Amsterdam are incredibly beautiful, and there’s nothing like seeing the city from a boat. What a great and fantastic walking tour guide – thanks so much! I can’t find the downloadable maps for 24 hour s and 3 days in Amsterdam, they seem perfect for my trip coming up in a couple of days… can you email them to me? Or help me locate them? Also is there anything special to do or to look out for on 3-5 may for liberation and remembrance days? Thank you so much!! Hi Sasha, apologies about the maps. They’re up now. I don’t understand why they went missing from the post, but you can click the points to save them on your Google Maps! I’m working at making a printable version of this! You should find some parades around the Netherlands for Liberation Day and there’s two minutes of silence. I’m pretty sure there’s a couple events around Amsterdam, notably in Dam Square each year for Liberation day, but the 5th of May isn’t a public holiday every year, only every couple years. As a result, I’d check for events on May 4th for this year. Thank you so much for all of this information. I had a few hours free on a business trip yesterday and followed most of the tour as recommended. I saw so much that I would not have seen without it and really appreciated a local’s recommendation. I especially loved the Van Stapele Koekmakerijto cookie shop and would never have found that without your advice! I brought a tin of them home for my family and it was a lovely trip and nice souvenir. Thanks again! Thank you so much for your feedback and for sharing your experience! I’m so glad that you enjoyed my walking tour. 🙂 I hope your family loves the cookies! This looks great. We will be in Amsterdam August 14, 2018 and plan to take this walking tour. I would appreciate a detailed map of the tour if you can. Hi James, you’ll find a detailed map in the post. Please check it over. YES! it works, thank you! I could not thank you more for this and others articles. I spent a perfect day in Amsterdam wandering the city with your map and advice. Now I am studying the Paris part as I am going to visit it soon for the first time. I’ve read a lot of travel blogs in my life, and your’s is the best. Hello Karen. I’m so glad your site came up when my daughter and I googled self guided walking tours in Amsterdam! We didn’t follow your itineraries to the letter, but made good use of your tips and suggestions for places that are a bit off the usual tourist track. Thanks to you we saw the wonderful church in the attic, my daughter had what she claims is the best chocolate cookie EVER, we ate bitterballen at the Foodhallen (can’t say we liked them much, but it was an experience! ), watched a cat run up a tree in the Karthuizerhofje and my daughter even caught a few Pokemon. Thank you!